As you have no doubt heard, the PGA is debating the possibility of moving the PGA Championship outside of the US occasionally "to help grow the game of golf worldwide." In fact, the Grey Goose 19th Hole crew debated whether it was a good idea or not Friday night. In case you haven't heard about it, understand that the PGA can't do it until 2020 at the earliest. They've already named American courses to be used until then. The debate was quite interesting. Host Laura Baldesarra wasn't in favor of it -- it's the PGA of America, after all -- while her media panel was split over the issue. It might work occasionally, all golf bodies should be interested in growing the game, it could help give the last major more of an identity... you know, a rehash of the standard issues that get raised. And none of them wanted a fifth major. I'll make this post short and sweet. First, if you want to grow the game, you eventually have to play a major outside the US and Europe. Period. Whether you move an existing one around the planet or create a fifth one exclusively for "the rest of the world," you eventually have to get a major "out there." Otherwise you send the message that golf is still basically an American/European game, that golf in the rest of the world isn't as important as golf in the US and Europe. The powers-that-be may not like it, but that's how it will be interpreted. And second, if you want to give the PGA Championship a more distinctive identity, that's a no-brainer: Return it to the match play format it started in and was played as from 1916 through 1957. Snead, Hogan, Nelson, Sarazen -- these greats all won multiple PGAs in this format. 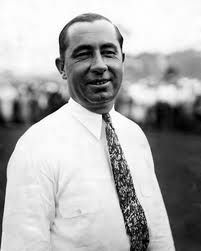 In fact, we remember Walter Hagen (pictured at right) as a 5-time winner in this format, 4 of those in a row! It's simple enough to do... just use the US Amateur format. Have two days of stroke play to cut the field to 64, then let the survivors play 18-hole matches (and a 36-hole final) to determine the winner. Make "Glory's Last Shot" a real test of golf! Let it test players at stroke play AND match play! Make the Wannamaker Trophy not just the final major trophy of the year, but a prize that can truly say it tested its winner in every way possible. Not even the Accenture Match Play can claim to do that. I know they aren't going to listen to me, but I bet it would get people's attention. It's not even a debate for me.